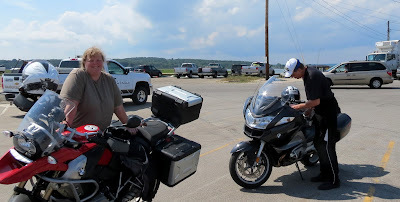 Mike and Lori posted all the nice pictures of Beemer Girl and Chris and their trip from Georgia to Maine! 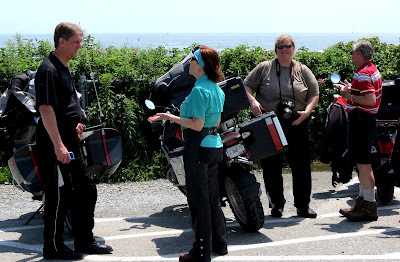 Mike http://scooterthefun.blogspot.com has two posts of the visit, Lori http://loveofamotorbike.blogspot.com/ has one - all with great photos. I'll add my humble contributions now. After a marvelously varied breakfast served and cooked by Rebecca and Mike at their home in South Portland, we rode to Fort Williams, home of Portland Head Light. Here Chris talks with Rebecca, while Mike talks to Lori - she's the only one who heard my suggestion to "Smile." 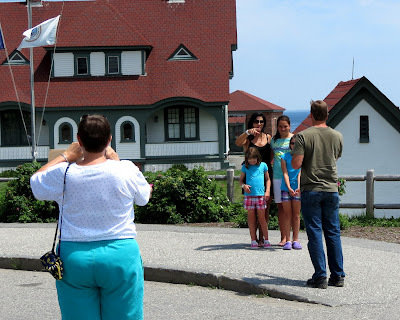 The lady in front takes a photo of the Lighthouse, while the director of the family on the right makes "suggestions" to the assistant director on how to take a picture. Meanwhile, I take a picture of the picture-takers. 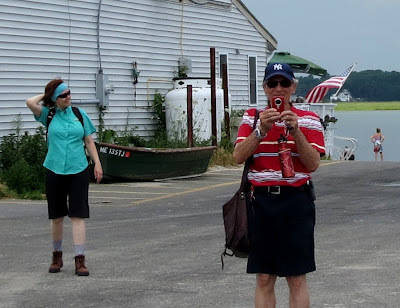 Speaking of picture-takers: Mike takes a picture of me taking a picture of him. 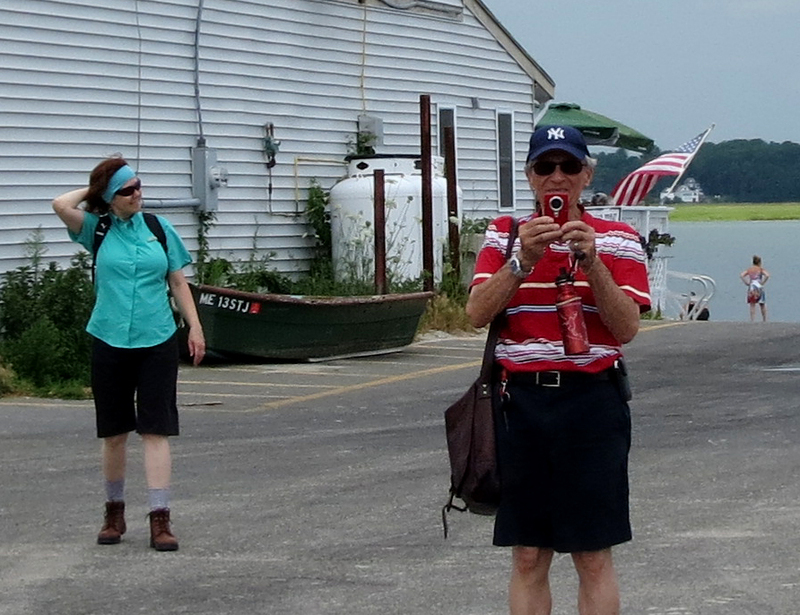 ...while a small island ferry passes in front of Rebecca and Chris. The couples have just had an appetizer: it's mid-afternoon - don't want to spoil dinner. I, on the other hand, had a breakfast of burger and fries. Since I sleep from 5 am to 1 pm most days, my dining schedule is a tad odd. Odder still is meeting Mike for a ride at times he considers middle of the day. The truth is that I have always enjoyed the quiet night to the cacophonous day. Lori and Chris prepare to ride off with Mike and Rebecca, while I head home to prepare dinner for my sweetie. She works hard at a psychiatric hospital, and works out at a gym four days a week. My function is to ride, write, read, watch baseball like a fanatic, and have a good dinner ready when she gets home. I have waited my whole life to live this way. If Kathy hadn't made the decisions she made, early in our marriage, she'd be a widow. So cooking for her, keeping our home semi-neat, is no sacrifice. I did a little math: I'll have to live to 103 years, seven months, and a few days to equal the sacrifices she has made to keep me sane and sober. Great additions to the photograph pool! 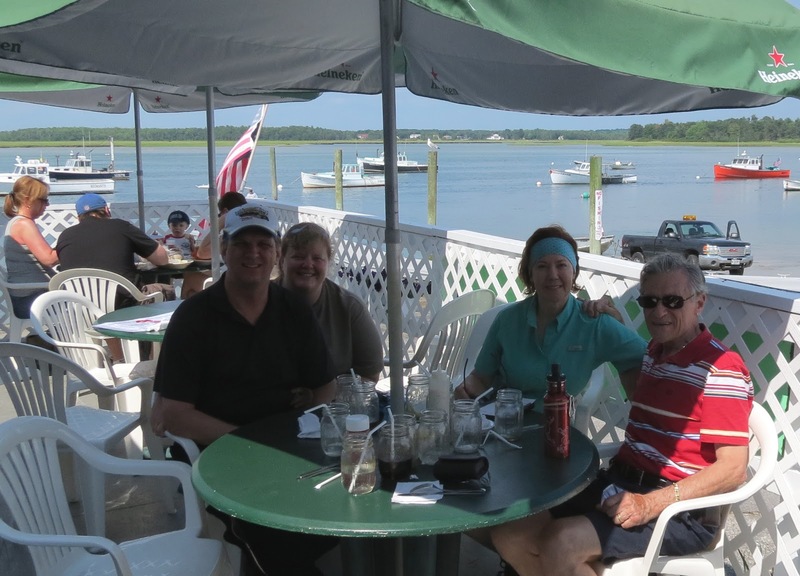 We had a great time riding and relaxing with you. Thank you for sharing your time with us. And as much as we missed you at the end of the day, it is with complete understanding to lose you as you were going to take care of Kathy. Oilburner and I are in negotiations to see if we can pull off a January visit to see the Head Light. It's exciting to meet new riders, and the other kinds, too. I may be spoiling Kathy with so many lobsters, but who knows how long prices will stay low. It could be back up over $10 or higher by tomorrow. January? I hope you are flying! Up here, we don't even think about going outdoors except to work. Then there's Mike and I, who ride year round. But short hops only. When you come, we'll make sure you stay warm. Yes, thinking of flying or driving. I told Chris I would need a sidecar to get used to ice and snow. So you have been in on it, too? Great, you guys could meet up. It is always cool to meet riders. So glad you added to the fray – for two reasons: 1) You always have such a different and wonderful take on what's happening, and 2) You always take such great pictures. A word, though.... 10:30 in the AM is NOT early morning. Just want to set the record straight. I'm sorry you were unable to make the second half of the trip, because it would have saved me from my little white lie. I was trying to get us to that infamous place (the beach we always get lost going to) and led us right to Cape Porpoise! Great post. I love seeing the pics of the blogger meet ups. It makes the world seem a little smaller when a few of us can gather and share a ride and a meal. Twenty-five bucks a pound?! Outrageous - that price would drive me tuna fish in a can. BeemerGirl and Oilburner (Lori and Chris of http://loveofamotorbike.blogspot.com/) are planning a return to Maine to experience a genuine winter. All are welcome to visit. Mike and I will provide a map and encouragement.